The SOS readers' studios covered in the Readerzone section over the last few years have come in all sorts of shapes and sizes, but few have been as compact as that of West Midlands-based John Hackett and Andy Wood. 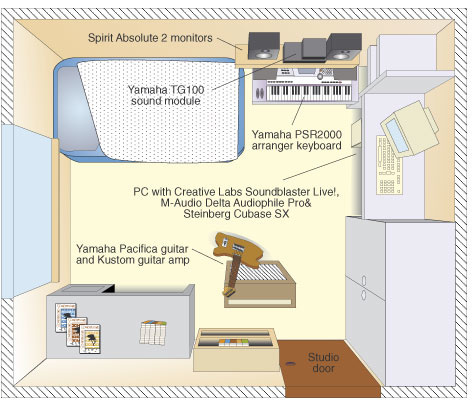 The studio essentially revolves around a fairly modest PC, John's Yamaha PSR2000 keyboard, Andy's various guitars, and a monitoring system comprising a Samson amp and pair of Spirit Absolute 2 nearfield monitors. The majority of this is tucked into a small corner of the spare bedroom John shares with his brother. 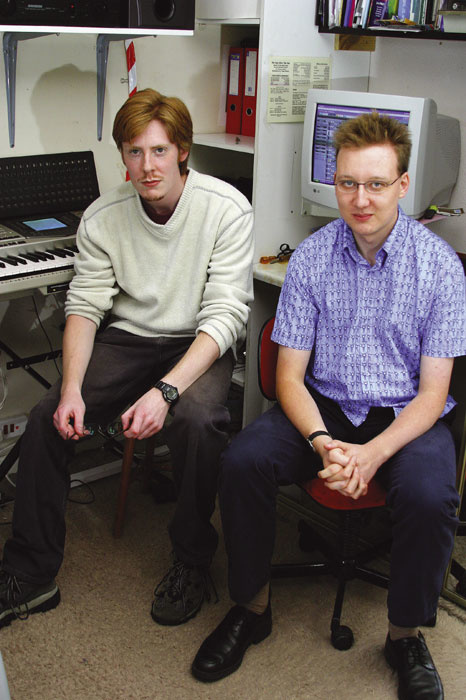 Yet John and Andy have not allowed equipment to impose too many constraints: within the last 12 months the studio has been used to create music and sound effects materials for two theatre groups and to develop 'on hold' music/sales voice-over messages for the telephone system of a local company. With both of them also holding down full-time day-jobs, these projects have meant slower progress towards the completion of their own recording project, a collection of songs that they hope will develop into an album, and which constitute the reason for their original interest in recording technology. Although John and Andy initially met in 1991, it wasn't until 1997 that they got together in a musical context. While John had been exposed to a basic MIDI sequencing setup at school and, as a result had bought a Yamaha PSR500 keyboard, Andy, in the well-established tradition of SOS readers, had been spending time experimenting with a stereo tape deck, recording song ideas with John's brother, Richard. At one of these sessions, John was dragged into to provide an additional pair of hands and, for the next couple of years, minus John's brother, the duo continued to dabble with basic stereo tape recording. One advantage of a computer-based setup, of course, is size. 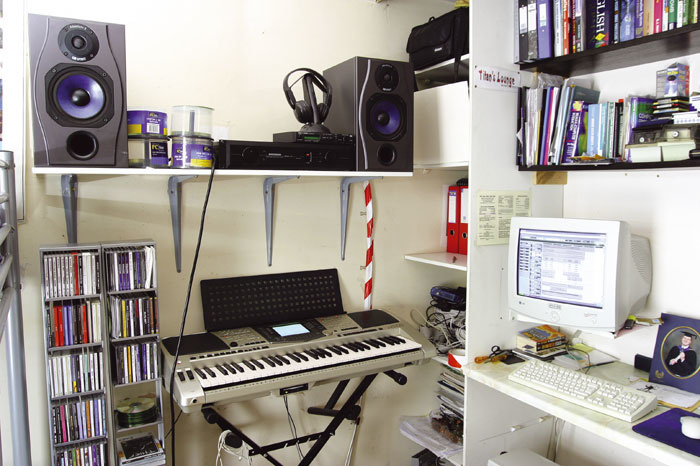 This whole studio occupies the corner of a bedroom. "We had started to read about recording technology, but in 1999, by the time we thought seriously about something more than messing about with a stereo tape deck, computer-based recording was getting to the point where it was cheap enough to compete with a decent cassette-based multitrack," says John. "We had access to a PC so we bought a copy of Cool Edit Pro and a SoundBlaster Live audio card and started to work with those. Cool Edit is an 'audio-only' environment, so all our recording efforts on that were done without MIDI." While they continued to acquire other bits and pieces of software and hardware, budget and space prevented anything much more sophisticated from developing. Andy: "We had played around with demos of Cubase and could see the advantages that software-based instruments could offer to people like us, in terms of cost and space, relative to hardware. After reading the SOS review of Cubase SX we just decided that was our next step. We bought SX and Halion, both for the PC, as I've a background in IT working with PCs. So although price was an issue, sorting any technical issues out wasn't, as I could do all that myself." 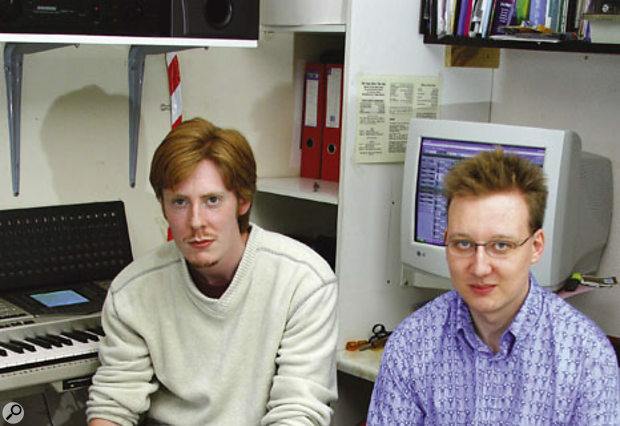 After a few problems with Halion, John and Andy switched to Native Instruments' Kontakt software sampler, and now have other NI software instruments in their computer-based studio. "SX and these virtual instruments have completely changed the level of what we can do here and how we can work. A single PC is now almost a complete studio," says John. 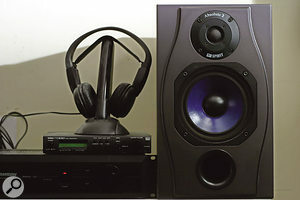 This said, the duo would put one relatively recent hardware addition at the top of their 'most significant' list — their Spirit Absolute 2 nearfield monitors. John describes why: "We started out just using some crappy computer speakers for monitoring, which was OK, but the results didn't translate very well to other playback systems. We then scrounged a set of Cambridge surround speakers, but in a room this size they had way too much bass response, and then our mixes just sounded tinny when played elsewhere. Anyway, about 15 months ago we bought the Samson amp and Absolute 2 monitors. These are still pretty low-budget in terms of studio monitoring and we know this room is far from ideal as a control room, but the difference has just been dramatic. Perhaps for the first time we think we can now hear what we're recording and mixing accurately enough for it to stand a decent chance of working on another system. If any other SOS readers are just starting out with their own studios, put a decent monitoring system at the top of your shopping list!" One common studio item absent from the present setup is a hardware mixer. The pair can see it might have uses, but at present there are other items nearer the top of their 'wanted' list. "A hardware mixer would be useful, but as so many of our sound sources are inside the PC, SX handles all the mixing duties at present," says Andy. "John's keyboard gets DI'd, and the same goes for the guitar, using a little Zoom effects unit, or we'll shove a mic in front of my amp. Two things we would like are a decent condenser mic and something like a Line 6 Pod. We are starting to do more vocal recording and I'm sure a mic in the £300-£400 price bracket would really help there. I've also been trying out the various amp modellers, and one of those will be my next purchase. We tried a plug-in for this, but it wasn't up to the job, and really I'd like something I could use live as well. I'll continue to upgrade the PC as required." "And I'd really like a Korg Triton!" adds John. PC with AMD 1100 MHz processor, 512MB RAM. Creative Labs SoundBlaster Live! Platinum. M-Audio Delta Audiophile Pro soundcard. Steinberg Cubase SX MIDI + Audio sequencer. Cool Edit Pro 2.0 audio editing software. IKM Fruity Loops loop software. IKM T-Racks 24 mastering software. Native Instruments Kontakt software sampler. Though John and Andy started their recording interest as a way of demoing song ideas, their use of the studio has taken a different turn over the last 12 months. After reading an article on theatre sound, Andy joined a local theatre group with a view to gaining some practical experience of this. John soon also got interested and the pair eventually ended up with full responsibility for the sound of a complete production which went ahead earlier this year. John elaborates: "We did two pieces of original music, one for the introduction and one for the final curtain. However, the play also required all sorts of sound effects and we created those from scratch. Some of these were a bit odd, as the play was actually a 'play within a play'. For example, one of the sound effects was supposed to be a tape machine that itself contained some sound effects but that was going haywire — speeding up and slowing down. We simply recorded a whole bunch of stock sounds into Cool Edit and then did all sorts of random tempo stretching. We also had to do an effect of dialogue speeding up that was supposed to represent time passing rapidly. Again, this was all done in Cool Edit. While the whole process meant learning a lot of new things, we decided to run the whole lot live from the PC during each performance. Essentially, each audio cue — whether music or a sound effect — was sequenced into Cool Edit and we just triggered them by hand at the right moment. It was a bit 'seat-of-the-pants' at times, but on the whole it worked really well and we got some very positive feedback." Decent monitors should be high on anyone's list of studio priorities. Andy and John feel the Spirit Absolute 2s have made a big difference to their mixes.Photo: Jyoti MishraThe duo then became involved with the establishment of another local theatre group. Its initial production, however, was a slightly bigger task, as it encompassed both audio and lighting. As well as 'topping and tailing' with music, the production also required incidental music at various stages — something that's "not that common outside the professional theatre," as Andy explains. "We had about 12 weeks to put together the music, do the sound effects and learn how to run the lighting. The aim was to create an almost film-like atmosphere. The sound effects ran from seagulls to vacuum cleaners and there were all sorts of different musical styles, including some fairground organ music and a James Bond-style 10-second sting. In addition to the spot sound effects, in order to get that film-like atmosphere, we also created ambiences suitable for particular scenes, like the seaside or the inside of a busy café. We were working on the sound effects up to the day of the production but the real nightmare was the hardware. First up, the audio playback system was four channel and somewhat temperamental. In addition, the electrical supply in the hall being used for the performance was not the greatest and we were constantly blowing fuses. In the end, we set up all our equipment right beside the fuse box, so that if something did blow during the performance, one of us could deal with that while the other did their best to keep the lights and sound happening on cue. All the audio was delivered via Cool Edit." The performance was very well received and has recently been repeated, with John and Andy adding some additional background sound. The theatre company now plans to take the same show 'on the road'. "That means we need a mobile setup — perhaps a laptop and portable sound and lighting equipment," says John. "But If the group can fund that, it would certainly be a good experience for us." Master controller duties go to the Yamaha PSR2000.Photo: Jyoti MishraA connection made through the theatre projects has also recently led to a further recording task for John and Andy. Andy explains: "An associate of ours needed a new piece of 'on hold' music with a suitable advertising voice-over for a company telephone system. The people he had used before couldn't do it so he approached us. We agreed a fee and, with a brief of 'something contemporary', it took us just a few hours to put the music together. "We created an ambient synth-style piece based around a two-bar drum loop that I programmed. John then added a simple chord pad part and melody. The 'voice talent' was supplied by a member of the theatre group. All this was recorded into SX. We then had to do some work to clean up the vocal — getting rid of some sibilance, for example. We used SX's automation to duck the music behind the vocal where needed. The final mix was then to mono, with some compression and EQ to stop anything getting too out of hand when heard through a typical telephone handset. Interestingly, this kind of mini-advert as part of an on-hold system is something that seems much more hard-sell in places like America, but here in the UK it doesn't seem so widely used — and there is some really dreadful music being used out there when people can not afford to get involved with licensing commercial tracks." "This is something we would like to explore further," adds John. "This first job proved we can do the technical side, so now we are looking into how we could market the service. My degree was in business so I'm hoping to be able to put some of that into practice. Depending on how it went, we could put the money back into the studio to support our other recording projects." Native Instruments Pro-53 soft synth. Native Instruments Reaktor soft synth. Native Instruments FM7 soft synth. Steinberg WaveLab 4.0 audio editing software. Selection of plug-ins and sample CDs. Yamaha Pacifica guitar and Kustom guitar amp. The PC running Cubase SX is at the heart of everything for Andy and John.Photo: Jyoti MishraThe combination of their day jobs, live theatre, and exploring the possibility of creating a 'telephone-audio' niche has left John and Andy little time during the last 12 months for other recording projects. However, the duo are gradually putting together material for what will become an ambitious album project. "The album title is Arc Of Infinity, and I think we've already missed about five self-imposed deadlines on this!" admits Andy. "But we're getting there slowly and we have a good number of ideas in various stages of development." John explains the creative process. "Having roughed out a song idea on keys or guitar, when it comes to building up the recording we tend to start with drums. We usually build our own drum loops using Fruity Loops, but then export the kit as a number of separate tracks to bring into SX. This means we essentially have five or six drum tracks, as if we had multi-mic'd a real kit, and we have the same sort of control when it comes to mixing. We recently bought the Bob Clearmountain drum samples, which we really like, and we now use these for pretty much all our drum sounds. The quality is excellent — the samples just seem so well recorded, even if you listen in isolation to the tails of the sounds. Tears For Fears have apparently also used them on recent albums and that is the kind of sound we're aiming at. Once the drums are sorted, we then build up keyboard parts for the basic chord sequences, before adding bass and then moving on to the guitar or piano parts. Vocals usually happen last. 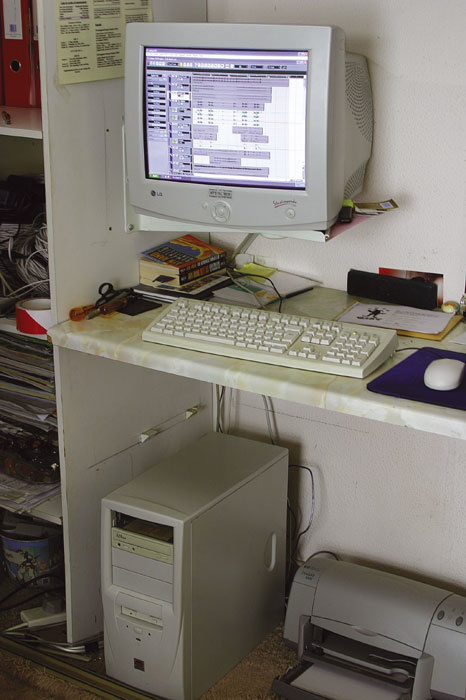 From the software perspective, it's Fruity Loops to SX to Cool Edit and a touch of T-Racks." John Hackett and Andy Wood are an excellent illustration of how anyone with relatively modest studio equipment can achieve results with a little hard work, determination and passion. "Our main problem is not really limited equipment but limited time," concludes John. "We will now be bringing some of the discipline for meeting deadlines that we learnt from the live theatre work to the recording of our own material. But if anyone needs some custom music for their telephone on-hold system, we would be happy to hit that deadline as well!"